Does the name Cathal Leonard @chefstip69 mean anything to you ? Well !!! To all Foodies out there .... It should . While we are very fortunate in Ireland to have many great Chefs , there are a few who shines above everyone else and one such man is Cathal Leonard , a very private and far too modest Chap . Previously and for many years Head Chef @ChapterOneDub and for the past 16 months Executive Head Chef @TownKildareSt .... But last night , Cathal Leonard did his last Service at Town Kildare Street . He is moving on .... But as to where ??? still under wraps . What a loss to TownKildareSt !!! as this is one Chef who sure can cook and has the palate of a God . I was fortunate to have worked with such a great Chef when I was myself a Chef in Chapter One many moons ago . He is a true believer in Clean flavours , Seasonality and Imagination . Watch this space , He will be the next to hang his own Michelin * . And well deserved, it will be too and I cannot wait to go and eat his Divine food once again . 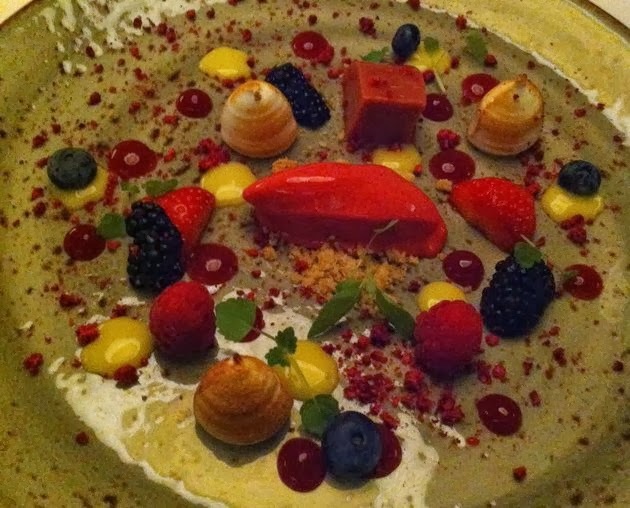 Here are some dishes , I recently had from Cathal Leonard and would like to share with you . A Starter of Seared Castletownbere Scallops, Cauliflower pureé, Squid ink aioli , Lemon oil & Basil cress was elegantly presented on large plates. 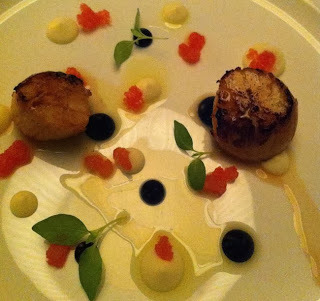 Small mounds of Cauliflower puree and Squid ink aioli dotted the plate , along with some baby basil cress and lemon oil . The Scallops were perfectly cooked, moist and succulent , they melted like butter on your tongue. The pureé , aioli and lemon oil made this a perfect mouthful . Next a Carpaccio of Ox tongue with Lapristi , Raisins and Mustard puree , Crispy shallot and Carrot tops was an assemblage of very thin disc of Ox tongue . 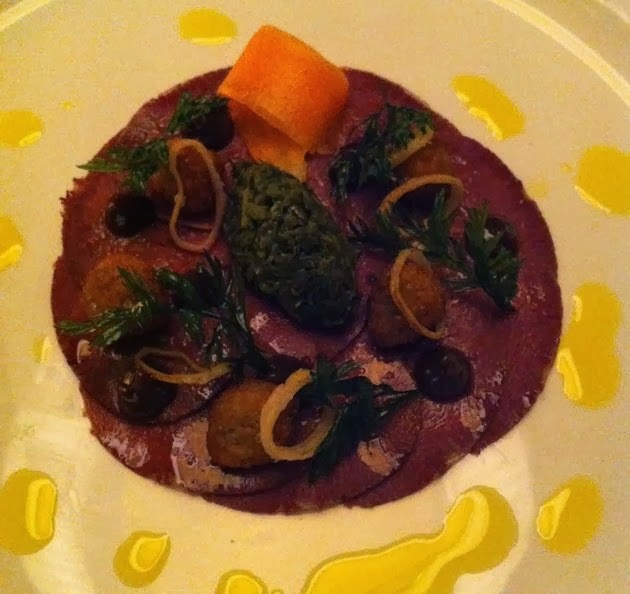 The Lapristi, a Samphire type of vegetable that grows inland as opposed to marshlands , tasted similar to Capers flowers , it complimented the delicate flavour of the Ox tongue and combined with the other flavours from the Raisins and Mustard pureé , this dish was quite Sublime . With two impressive Starters down a Cured Clare Island Organic Salmon tartar , Pea mousse , Asparagus , Quail's eggs , Rapeseed mayonnaise & Yuzu tabikko wasn't far behind . 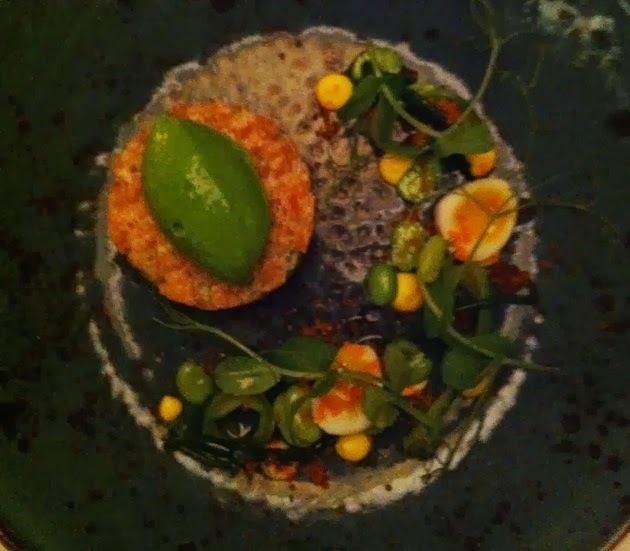 The glorious colours of the Salmon & Pea mousse were enchanced by the dark earthenware glaze of the plate and along with the bright yolk of the Quail's egg , shavings of New Season Asparagus , Broad beans and green baby shoots , It was Sunshine on a plate . There was no mistaking the Salmon flavour here , and it was perfectly seasoned . The Pea mousse added an extra dimension so was the Yuzu tabikko the ideal dressing for the greens and Quail's egg . This was so fresh one could almost taste the outdoors . Our next dish of Slow Cooked Salt Marsh Duck Breast , Smoked Italian Peaches , Carrot pureé, Pickled Carrot & Braised Endives was a cornucopia of glorious colours , smells and textures , A feast for the eyes , glistening on the plate were three richly glazed medallions of duck breast . 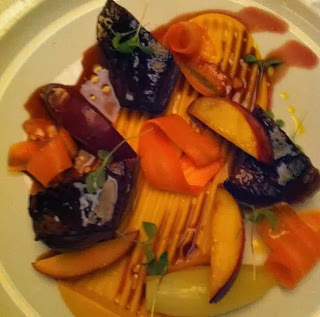 Helped by the sweet and smooth Carrot pureé , every sultry slivers of the lightly smoked peaches and pink slice of duck breast which seperated from it's skins in moist forkfuls of flesh was devoured . The pickled Carrot shavings and braised endive gave it an unexpected dimension of flavours ... Glorious..
A Summer Berry Plate was a very stylish and devilish presentation of Summer Berries , Meringue , Strawberry jelly , Lemon cream ,& Raspberry sorbet , all set on a textured and speckled plate tempting you to dig in with gusto . Beautifully coloured dots of jelly and Lemon cream dotted the the plate along with tiny Meringues and poached berries . The sweet and tart flavours danced in unison with the smooth and cold textures and each spoonful was an explosion of Estacy. 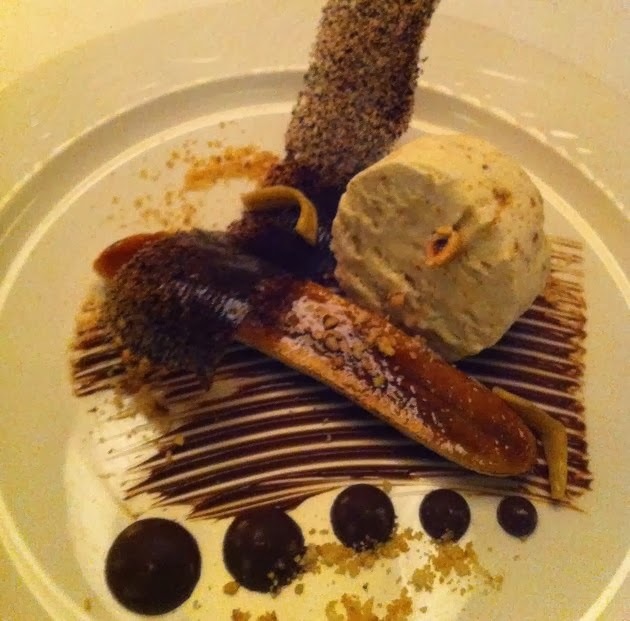 A Hazelnut Praline Parfait with Caramelised Banana , Coffee tuile and Chocolate Sauce was fabulous and dramatic in presentation . 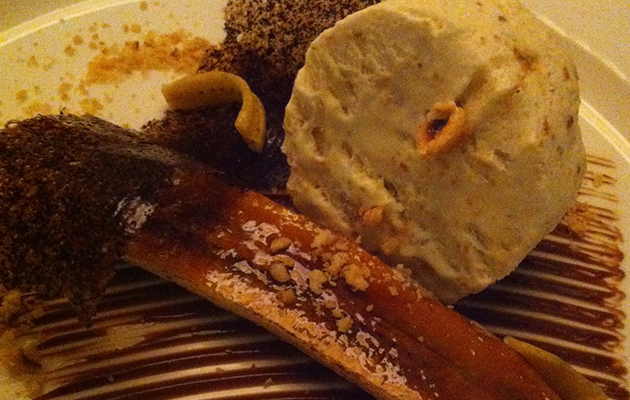 While I am not a fan of banana in dessert , I must confess that this little delice won me over . Beautifully caramelised banana and not overpowering in the slightest embraced the creamy and smooth Hazelnut praline parfait while the Coffee tuile with it's trace of bitterness was a welcoming bite and the dark Gianduja Chocolate sauce took this dessert to another level altogether . Until the news of where this true Masterchef is going to be , I can only dream of these amazing dishes and salivate on the memories. Follow Cathal Leonard on Twitter @chefstip69 and you will be in the know as to where is the next stop !! !